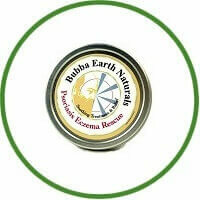 Bubba Earth Naturals crafted Psoriasis Eczema Rescue Treatment product specifically for psoriasis, eczema and other problem skin with inflammation, itch, and scaling. They formulated this NEW Psoriasis Eczema Rescue using the latest medical finding from medical studies. This product is manufactured specifically for psoriasis, eczema and other problem skin with inflammation, itch, and scaling. 100% Natural with 10 select anti-inflammatory to reduce redness and inflammation. Premium oils designed to penetrate nourish soothe and permeate deep into the affected areas. Salve base with unprocessed beeswax to protect and retain moisturizer longer than creams or lotions. Un-scented and with no synthetics and can use as often as needed.